When Martin died in March this year (2003), Glen, Martin and I were surprised at the amount of cards we received from Maybole. We had thought we had been long forgotten. So we’d like to say a heartfelt “Thank You” to everyone who sent their condolences, along with all the rest of the Zagorski family here in England. 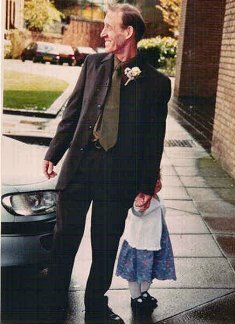 This photo of Martin was taken in April 2001, at Glen’s wedding to Michelle. The little one whose hand he is holding is Lauren (not that you can see much of her, but it’s the best, most recent picture of Martin I can find), our son, Martin’s daughter. When Glen and Martin were young, single and free, Martin spent a lot of time having a pint with them and when the grandchildren came along, he was totally devoted to them – they could wrap him around their little fingers, and if there’s one thing we can be thankful for, it is that he had the chance to spend time with three of them before he died, at the premature age of 53.